One of the most popular western show ring events of all breeds is TRAIL. In this DVD, Lynn will inspire new competitors to enter the show ring as well as give several training exercises to improve problems encountered by seasoned campaigners. She will teach you how to negotiate obstacles at the trot giving your horse confidence resulting in a “tick” free performance. In addition, Lynn will share show ring tips and obstacle strategies that will earn plus scores! Lynn will guide you through the steps of introducing a horse or rider to the basic training needed for Trail. This training is great for young horses starting under saddle or older horses bored with showing. Since most training DVDs only show you how to do something well, Lynn always demonstrates common problems and how to correct them. 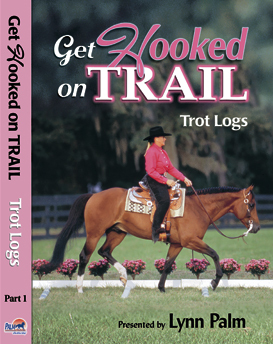 “Getting Hooked on Trail” will not only help you for the show ring, it will add variety to your daily training that is stress free for the horse. This will make your horse very happy!